A drum kit — also called a drum set, trap set (a term using a contraction of the word, "contraption")  , or simply drums — is a collection of drums and other percussion instruments, typically cymbals, which are set up on stands to be played by a single player,  with drumsticks held in both hands, and the feet operating pedals that control the hi-hat cymbal and the beater for the bass drum. A drum kit consists of a mix of drums (categorized classically as membranophones, Hornbostel-Sachs high-level classification 2) and idiophones – most significantly cymbals, but can also include the woodblock and cowbell (classified as Hornbostel-Sachs high-level classification 1). In the 2000s, some kits also include electronic instruments (Hornbostel-Sachs classification 53). Also, both hybrid (mixing acoustic instruments and electronic drums) and entirely electronic kits are used. A percussion instrument is a musical instrument that is sounded by being struck or scraped by a beater ; struck, scraped or rubbed by hand; or struck against another similar instrument. The percussion family is believed to include the oldest musical instruments, following the human voice. A cymbal is a common percussion instrument. Often used in pairs, cymbals consist of thin, normally round plates of various alloys. The majority of cymbals are of indefinite pitch, although small disc-shaped cymbals based on ancient designs sound a definite note. Cymbals are used in many ensembles ranging from the orchestra, percussion ensembles, jazz bands, heavy metal bands, and marching groups. Drum kits usually incorporate at least a crash, ride, or crash/ride, and a pair of hi-hat cymbals. A player of cymbals is known as a cymbalist. A snare drum or side drum is a percussion instrument that produces a sharp staccato sound when the head is struck with a drum stick, due to the use of a series of stiff wires held under tension against the lower skin. Snare drums are often used in orchestras, concert bands, marching bands, parades, drumlines, drum corps, and more. It is one of the central pieces in a drum set, a collection of percussion instruments designed to be played by a seated drummer and used in many genres of music. The rute, also known as a multi-rod, is a beater for drums. Commercially made rutes are usually made of a bundle of thin birch dowels or thin canes attached to a drumstick handle. These often have a movable band to adjust how tightly the dowels are bound toward the tip. A rute may also be made of a bundle of twigs attached to a drumstick handle. These types of rutes are used for a variety of effects with various musical ensembles. A rute may also be a cylindrical bunch of pieces of cane or twigs, bound at one end, like a small besom without a handle. The Rute is used to play on the head of the bass drum. Rute are also constructed from a solid rod thinly split partway down. All of these are classified as non-pitched percussion, allowing the music to be scored using percussion notation, for which a loose semi-standardized form exists for both the drum kit and electronic drums. The drum kit is usually played while seated on a stool known as a throne. While many instruments like the guitar or piano are capable of performing melodies and chords, most drum kits are unable to achieve this as they produce sounds of indeterminate pitch. The drum kit is a part of the standard rhythm section, used in many types of popular and traditional music styles, ranging from rock and pop to blues and jazz. Other standard instruments used in the rhythm section include the piano, electric guitar, electric bass, and keyboards. Percussion notation is a type of musical notation indicating notes to be played by percussion instruments. As with other forms of musical notation, sounds are represented by symbols which are usually written onto a musical staff. An electronic drum, also known as electric drums, digital drums, or electronic percussion, is a modern electronic musical instrument, a special type of synthesizer or sampler, primarily designed to serve as an alternative to an acoustic drum kit or other percussion instruments. An electronic drum consists of an electronic or digital sound module which produces the synthesized or sampled percussion sounds and one or more electric sensors to trigger the sounds. Like regular drums, the sensors are struck by drum sticks or by the hands and they are played in a similar manner as an acoustic drum kit. 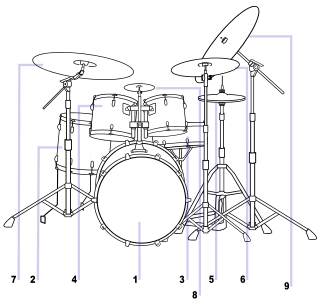 Many drummers extend their kits from this basic configuration, adding more drums, more cymbals, and many other instruments including pitched percussion. In some styles of music, particular extensions are normal. 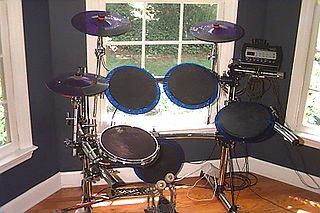 For example, some rock and heavy metal drummers make use of double bass drums, which can be achieved with either a second bass drum or a remote double foot pedal. Some progressive drummers may include orchestral percussion such as gongs and tubular bells in their rig. Some performers, such as some rockabilly drummers, play small kits that omit elements from the basic setup. Tubular bells (also known as chimes) are musical instruments in the percussion family. Their sound resembles that of church bells, carillon, or a bell tower; the original tubular bells were made to duplicate the sound of church bells within an ensemble. Each bell is a metal tube, 30–38 mm (1 1⁄4–1 1⁄2 in) in diameter, tuned by altering its length. Its standard range is C4–F5, though many professional instruments reach G5. Tubular bells are often replaced by studio chimes, which are a smaller and usually less expensive instrument. Studio chimes are similar in appearance to tubular bells, but each bell has a smaller diameter than the corresponding bell on tubular bells. 4 time). While the music was first designed to accompany marching soldiers, this simple and straightforward drumming approach led to the birth of ragtime music when the simplistic marching beats became more syncopated. This resulted in a greater swing and dance feel. The drum set was initially referred to as a "trap set", and from the late 1800s to the 1930s, drummers were referred to as "trap drummers". By the 1870s, drummers were using an "overhang pedal". Most drummers in the 1870s preferred to do double drumming without any pedal to play multiple drums, rather than use an overhang pedal. Companies patented their pedal systems such as Dee Dee Chandler of New Orleans 1904–05. Liberating the hands for the first time, this evolution saw the bass drum played with the foot of a standing percussionist (thus the term "kick drum"). The bass drum became the central piece around which every other percussion instrument would later revolve. William F. Ludwig, Sr., and his brother, Theobald Ludwig, founded the Ludwig & Ludwig Co. in 1909 and patented the first commercially successful bass drum pedal system, paving the way for the modern drum kit. Wire brushes for use with drums and cymbals were introduced in 1912. The need for brushes arose due to the problem of the drum sound overshadowing the other instruments on stage. Drummers began using metal fly swatters to reduce the volume on stage next to the other acoustic instruments. Drummers could still play the rudimentary snare figures and grooves with brushes that they would normally play with drumsticks. A fill is a departure from the repetitive rhythm pattern in a song. A drum fill is used to "fill in" the space between the end of one verse and the beginning of another verse or chorus. Fills vary from a simple few strokes on a tom or snare, to a distinctive rhythm played on the hi-hat, to sequences several bars long that are short virtuosic drum solos. As well as adding interest and variation to the music, fills serve an important function in preparing and indicating significant changes of sections in songs and linking sections. A vocal cue is a short drum fill that introduces a vocal entry. A fill ending with a cymbal crash on beat one is often used to lead into a chorus or verse. The hi-hat cymbals (nicknamed "hats") consist of two cymbals mounted facing each other on a metal pole with folding support legs that keep a hollow support cylinder standing up. Like the bass drum, the hi-hat has a foot pedal. The bottom cymbal is fixed in place. The top cymbal is mounted on a thin pole which is inserted into the hollow cymbal stand cylinder. The thin pole is connected to a foot pedal. When the foot pedal is pressed down, a mechanism causes the thin pole to move down, causing the cymbals to move together. When the foot is lifted off the pedal, the cymbals move apart, due to the pedal's spring-loaded mechanism. The hi-hats can be sounded by striking the cymbals with one or two sticks or just by opening and closing the cymbals with the foot pedal, without striking the cymbals. The ability to create rhythms on the hi-hats with the foot alone enables drummers to use both sticks on other drums or cymbals. Different sounds can be created by striking "open hi-hats" (without the pedal depressed, which creates a noisy sound nicknamed "sloppy hats") or a crisp "closed hi-hats" sound (with the pedal pressed down). As well, the high hats can be played with a partially depressed pedal. A three-piece drum set is the most basic set. A conventional three-piece kit consists of a bass drum, a 14" diameter snare drum, 12"–14" hi-hats, a single 12" diameter hanging tom, 8"–9" in depth, and a suspended cymbal, in the range of 14"–18", both mounted on the bass drum. These kits were common in the 1950s and 1960s and are still used in the 2010s in small acoustic dance bands. It is a common configuration for kits sold through mail order, and, with smaller sized drums and cymbals, for kits for children. Other kits will normally have 12" and 13" hanging toms plus either a 14" hanging tom on a stand, a 14" floor tom, or a 16" floor tom. For depths, see Tom-tom drum#Modern tom-toms. In the 2010s, it is very popular to have 10" and 12" hanging toms, with a 16" floor tom. This configuration is often called a hybrid setup. The bass drum is most commonly 22" in diameter, but rock kits may use 24", fusion 20", jazz 18",  and in larger bands up to 26". A second crash cymbal is common, typically an inch or two larger or smaller than the 16", with the larger of the two to the right for a right-handed drummer, but a big band may use crashes up to 20" and ride up to 24" or, very rarely, 26". A rock kit may also substitute a larger ride cymbal or larger hi-hats, typically 22" for the ride and 15" for the hats. Drum muffles are types of mutes that can reduce the ring, boomy overtone frequencies, or overall volume on a snare, bass, or tom. Controlling the ring is useful in studio or live settings when unwanted frequencies can clash with other instruments in the mix. There are internal and external muffling devices which rest on the inside or outside of the drumhead, respectively. Common types of mufflers include muffling rings, gels and duct tape, and improvised methods, such as placing a wallet near the edge of the head. Some drummers muffle the sound of a drum by putting a cloth over the drumhead. A number of accessories are designed for the bass drum (also called "kick drum"). Ported tubes for the bass drum are available to take advantage of the bass reflex speaker design, in which a tuned port (a hole and a carefully measured tube) are put in a speaker enclosure to improve the bass response at the lowest frequencies. Bass drumhead patches are available, which protect the drumhead from the impact of the felt beater. Bass drum pillows are fabric bags with filling or stuffing that can be used to alter the tone or resonance of the bass drum. A less expensive alternative to using a specialized bass drum pillow is to use an old sleeping bag. Drum kit music is either written down in music notation (called "drum parts"), learned and played by ear, improvised, or some combination of some or all three of these methods. Professional session musician drummers and big band drummers are often required to read drum parts. Drum parts are most commonly written on a standard five-line staff. In 2016, a special percussion clef is used, while previously the bass clef was used. However, even if the bass or no clef is used, each line and space is assigned an instrument of the kit, rather than to a pitch. In jazz, traditional music, folk music, rock music, and pop music, drummers are expected to be able to learn songs by ear (from a recording or from another musician who is playing or singing the song) and improvise. The degree of improvisation differs in different styles. Jazz and jazz fusion drummers may have lengthy improvised solos in every song. In rock music and blues, there are also drum solos in some songs, although they tend to be shorter than those in jazz. Drummers in all popular music and traditional music styles are expected to be able to improvise accompaniment parts to songs, once they are told the genre or style (e.g., shuffle, ballad, blues). On early recording media (until 1925  ) such as wax cylinders and discs carved with an engraving needle, sound balancing meant that musicians had to be moved back in the room. Drums were often put far from the horn (part of the mechanical transducer) to reduce sound distortion. A hi-hat is a combination of two cymbals and a foot pedal, all mounted on a metal stand. It is a part of the standard drum kit used by drummers in many styles of music including rock, pop, and blues. Hi-hats consist of a matching pair of small to medium-sized cymbals mounted on a stand, with the two cymbals facing each other. The bottom cymbal is fixed and the top is mounted on a rod which moves the top cymbal towards the bottom one when the pedal is depressed. The ride cymbal is a standard cymbal in most drum kits. It maintains a steady rhythmic pattern, sometimes called a ride pattern, rather than the accent of a crash. It is normally placed on the extreme right of a drum set, above the floor tom. General MIDI or GM is a standardized specification for electronic musical instruments that respond to MIDI messages. GM was developed by the American MIDI Manufacturers Association (MMA) and the Japan MIDI Standards Committee (JMSC) and first published in 1991. The official specification is available in English from the MMA, bound together with the MIDI 1.0 specification, and in Japanese from the Association of Musical Electronic Industry (AMEI). Animusic is an American company specializing in the 3D visualization of MIDI-based music. Founded by Wayne Lytle, it is incorporated in New York, with offices in Texas and California. The initial name of the company was Visual Music, but changed to Animusic in 1995. A drumline is a section of percussion instruments usually played as part of a musical marching ensemble. A drumline can also be a section on their own competing against other marching drumlines. High school and college marching bands, drill and drum corps, drum and bugle corps, indoor percussion ensembles are some examples of groups that include a "drumline". 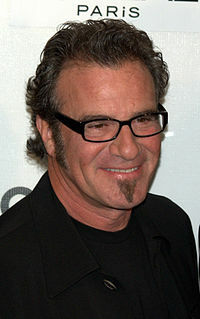 Hector Juan Samuel "Tico" Torres is an American musician, artist, and entrepreneur, best known as the drummer, percussionist, and a songwriter for American rock band Bon Jovi. In 2018, Torres was inducted into the Rock and Roll Hall of Fame as a member of Bon Jovi. Drum tablature, commonly known as a drum tab, is a form of simplified percussion notation, or tablature for percussion instrument. Instead of the durational notes normally seen on a piece of sheet music, drum tab uses proportional horizontal placement to indicate rhythm and vertical placement on a series of lines to represent which drum from the drum kit to stroke. Drum tabs frequently depict drum patterns. James Riley Breckenridge is the drummer for the band Thrice. He plays C & C Custom Drums, and uses Vic Firth drumsticks, Zildjian cymbals, Remo drumheads, with Drum Workshop hardware and pedals. Zoro is an American drummer, mainly in the styles of rock, R&B, and hip hop. Zoro is known as 'The Minister of Groove'. His outstanding feel, drive, syncopation and deep philosophies towards drumming have made him one of the most well-known and respected drummers in the world today. Drum hardware refers to the parts of a drum or drum kit that are used to tension, position, and otherwise support the instruments themselves. Heavy metal drumming is a style of rock music drum kit playing that developed in the late 1960s and early 1970s, largely in the United Kingdom and the United States. With roots in blues rock and psychedelic/acid rock drum playing, heavy metal drummers play with emphatic beats, and overall loudness using an aggressive performing style. Heavy metal drumming is traditionally characterized by emphatic rhythms and dense bass guitar-and-drum sound. The essence of metal drumming is creating a loud, constant beat for the band using the "trifecta of speed, power, and precision". ↑ "The Structure of the Drum:The drum kit-a collection of percussion instruments - Musical Instrument Guide - Yamaha Corporation". www.yamaha.com. Retrieved 2019-02-22. ↑ "OnMusic Dictionary". Music.vt.edu. Archived from the original on 28 September 2013. Retrieved 2014-07-28. ↑ Remnant, M. (1989). Musical instruments. (pp. 159–174). London: B.T. Batsford Ltd.
↑ "Elephant Drums". elephantdrums.co.uk. Archived from the original on 10 July 2010. Retrieved 18 July 2010. ↑ "Trinity College London | Home". Trinitycollege.co.uk. Archived from the original on 21 May 2014. Retrieved 28 July 2014. ↑ "MGR Music Tuition". mgrmusic.com. Archived from the original on 10 September 2017. Retrieved 30 March 2018. ↑ Nyman, John. "HomeFeatures Double Bass Legends: A Short History". Drum!. Retrieved October 28, 2018. ↑ Porter/Hull man/Hazel (1993). Jazz – From its Origins to the Present, p.18. ISBN 0-13-512195-7. 1 2 Nichols, Geoff (1997). The Drum Book: The History of the Rock Drum Kit. London: Balafon Books. pp. 8–12. ISBN 0879304766. ↑ Cohan, Jon (1995). Star sets: Drum Kits of the Great Drummers. Milwaukee, Wisconsin: Hal Leonard. ISBN 0-7935-3489-5. ↑ Information on Dodds is found in his own contemporary journals/biography "The Baby Dodds Story" -Louisiana State University Press, 1992, and by contemporary witness- drummer Gearge Wettling, who confirms Dodds was the first drummer to also keep the now-famous broken-triplet beat that became the standard pulse/roll of what we call ride cymbal playing. ↑ pages 8–9, Jon Cohan's- "Star Sets"- Wording, see page nine; paragraphs 1–4. Further: see the Percussive Arts Society, 'Hall of Fame' Article, by Rick Mattingly]. ↑ Sheridan, Chris (2002). Kernfeld, Barry, ed. The New Grove Dictionary of Jazz. 3 (2 ed.). New York: Grove's Dictionaries. p. 373. ISBN 1-56159-284-6. ↑ "Vital Beats Every Drummer Must Know". DRUM! Magazine. 2012-08-16. Retrieved 2019-02-22. ↑ Brown, Nate. "What is a Drum Fill, Really? – OnlineDrummer.com" . Retrieved 2019-02-22. ↑ "Steve Smith On The Art & History Of Drum Soloing". DRUM! Magazine. 2011-02-09. Retrieved 2019-02-22. ↑ says, Brant David (2014-02-11). "A History of the Drum Solo". A Journal of Musical Things. Retrieved 2019-02-22. ↑ "Drum Solos: A Brief History… And Can You Keep It Down A Bit?". Professional Moron. 2015-11-01. Retrieved 2019-02-22. ↑ "Guide to Drum Stick Grips". Liberty Park Music. 2017-02-13. Retrieved 2019-02-22. ↑ "Matched Grip Under The Microscope - Sono Music Brisbane". Sono Music Brisbane & Springfield QLD. 2018-05-04. Retrieved 2019-02-22. ↑ "Jim Chapin talks about the Moeller Method". 22 January 2007. Archived from the original on 30 June 2014. Retrieved 28 July 2014. ↑ "Dave Weckl – Moeller Technique". 29 January 2007. Archived from the original on 16 October 2014. Retrieved 28 July 2014. ↑ "Warren 'Baby' Dodds". The Percussive Arts Society. Archived from the original on 27 September 2011. Retrieved 21 November 2011. Dodds' way of playing press rolls ultimately evolved into the standard jazz ride-cymbal pattern. Whereas many drummers would play very short press rolls on the backbeats, Dodds would start his rolls on the backbeats but extend each one to the following beat, providing a smoother time flow. ↑ "Ringo´s cymbal sound". Steve Hoffman Music Forums. Retrieved 2019-02-22. ↑ "Birth Of The Modern Hi-Hat". DRUM! Magazine. 2013-05-16. Retrieved 2019-02-22. ↑ "hi-hat cymbals · Grinnell College Musical Instrument Collection". omeka1.grinnell.edu. Retrieved 2019-02-22. ↑ "The Evolution of the China Cymbal". reverb.com. Retrieved 2019-02-22. ↑ "The History of Electronic Drum Sets - 1960s to the 2010s". Electronic Drum Advisor. 2017-11-18. Retrieved 2019-02-22. ↑ "Brief History of Electronic Drums – Part 1". The Electric Drum. 2015-07-10. Retrieved 2019-02-22. ↑ Manning, Peter. Electronic and Computer Music. 1985. Oxford: Oxford University Press, 1994. Print. 1 2 Huber, David Miles. "The MIDI Manual". Carmel, Indiana: SAMS, 1991. ↑ ""Marimba Lumina Described". ''buchla.com''. n.p. n.d. Web". Buchla.com. Archived from the original on 1 November 2012. Retrieved 27 November 2012. ↑ White, Paul. "DIY Drum Pads and Pedal Triggers Archived 3 March 2016 at the Wayback Machine ". Sound On Sound SOS Publications. Aug 1995. Print. 1 2 Peckman (2007), p.31. ↑ "Vintage Olympic - a unique online history of Olympic drums". www.vintageolympic.co.uk. Retrieved 2019-02-22. ↑ "Funeral Of Queen Victoria – British Pathé". Britishpathe.com. 18 July 2010. Archived from the original on 4 July 2014. Retrieved 28 July 2014. ↑ "Longfellow's "A Psalm Of Life"". Blupete.com. Archived from the original on 31 December 2017. Retrieved 28 July 2014. ↑ "1805.4 – "The Muffled Drum" | Romantic Circles". Rc.umd.edu. Archived from the original on 21 May 2014. Retrieved 28 July 2014. ↑ Michael Robert Patterson. "Bivouac of the Dead – Arlington National Cemetery". Arlingtoncemetery.net. Archived from the original on 15 July 2014. Retrieved 28 July 2014. ↑ Ryan , A. (n.d.). Learning to play the drum: an experiential. 43(4), 435–444. ↑ "Practice Pad | Learn To Use A Practice Pad Effectively". www.rockdrummingsystem.com. Retrieved 2019-02-22. ↑ "Electronic Drums Market Insight, Size, Forecast to 2024". www.psmarketresearch.com. Retrieved 2019-02-22. ↑ "Vintage Snare Drums online Ludwig, Slingerland, Leedy, Camco, Gretsch, Sonor". www.vintagedrumguide.com. Retrieved 2019-02-22. ↑ "Drum Notation Guide". DRUM! Magazine. 2009-08-18. Retrieved 2019-02-22. 1 2 Porter/Hullman/Hazel (1993). Jazz – From its Origins to the Present, p.44. ISBN 0-13-512195-7. ↑ "Artist Series Attack Timbales (Dave Mackintosh)". Archived from the original on 22 January 2013. a pair of 8” diameter timbale shells with a depth of 9” and 11” respectively... 8" x 9", 8" x 11"
Wikimedia Commons has media related to Drum-kits .